Irish Freediver Stephen Keenan who died in Egypt. THE DIVING COMMUNITY both in Ireland and abroad is mourning the death of renowned Irish freediver Stephen Keenan who died during a dive in Egypt. Keenan died yesterday off the Egyptian coast near the tourist resort of Dahab. 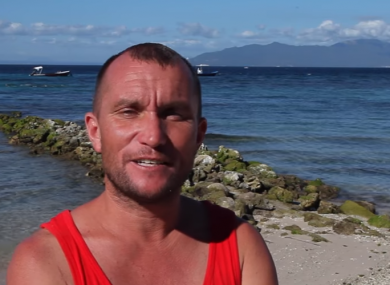 The 39-year-old from Dublin was the co-owner of freedive school Dahab Freedivers and the diving website DeeperBlue.com said that he was the holder of a number of Irish freediving records. Freediving is a method of diving where divers hold their breath and resurface rather than using scuba equipment. DeeperBlue.com reports that the exact circumstances around his death or not clear but that it is believed he was providing “safety cover for a female freediver” when he got into trouble. It’s reported that the diver was attempting to dive through a feature called the Arch at a spot called the Dahab Blue Hole. The feature consists of a 26m long tunnel at a depth of 56m. Given his prominence within the freedive community, colleagues and former dive students of Keenan have been leaving tributes to him online. “Today we received the tragic news of the passing of the strongest and most dedicated safety diver, and Vertical Blue’s chief of safety, Stephen Keenan. It seems the ocean takes the best away from us. He was a hero until the end and died while providing safety for a girl who got into difficulty,” professional dive team Vertical Blue wrote on Facebook. Those who knew him know that he was a person of integrity, of laughter and tears. Friend of his friends and always willing to pull his shoulder whenever needed. These are very difficult moments for everyone, but especially for his family and close friends. Our thoughts go to all of them. Email “'A hero until the end' - Tributes paid to renowned Irish diver who died while helping another diver”. Feedback on “'A hero until the end' - Tributes paid to renowned Irish diver who died while helping another diver”.